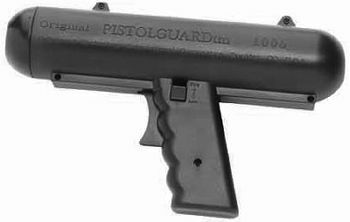 Originally developed and tested for use by law enforcement and the military, the Pistolguard provides the safety of distance and multiple shot fire power. It projects the 10% pepper spray in a wide angle and over 20 feet, making it suitable for multiple attackers. It comes with a 300 gram cartridge. The unit is 10 inches long and 5.75 inches high. Powerful, yet non-lethal. Very handy for security people!